This weekend was the Battle of Decatur Civil War re-enactment. 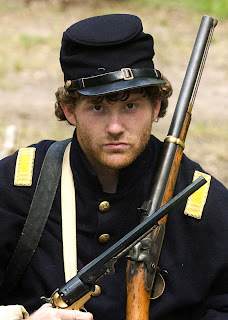 I thought it would help me make better pictures if I dressed in period costume and get on the battlefield with the other re-enactors. Basically staying out of the way was my main concern and not making it look too obvious that I was taking pictures with non-period gear. Clay Turner was nice enough to loan me some clothes and the guys at the 1st Calvary provided some key insight into the heart of a Union Soldier. my computer's audio isn't working but i like the pictures and the fact that you're doing multimedia when possible.